2016 is now well underway, with all of the crushing realities of the post-festive period - wider waistlines, slimmer bank balances and plenty of regret. In any case, Nintendo is starting the year in Japan with a collective smile, as the company continues to perform well in the busy shopping season. The latest Media Create results cover the final days of 2015 up to 3rd January, so don't include any new software releases. In fact the top five is the same group of 3DS and Wii U games from last week's results, albeit the ordering has been shuffled. Ultimately Monster Hunter X (Cross) remains dominant, with two Wii U evergreens also showing impressive momentum. Hardware results also bring positives, with the New 3DS LL (XL) leading, with that performance boosted further once the full 'family' of portables is included; oddly the old smaller 3DS narrowly out-sold its New 3DS equivalent, presumably off the back of some discounts or bundles. Wii U had a sizeable dip and has now fallen behind PS4 and Vita, though sales of 53,547 units are still well above the norm seen in past months. The results are below with last week's sales in brackets. Nintendo's had a strong few weeks in the Japanese market, and is no doubt hoping to sustain that momentum for as long as possible. And the Wii U is going back towards it's normal numbers. The Xbox isn't last this week... and I'm a bit surprised that there's no Minecraft for Wii U in the charts? Seeing as it always does well on Playstation over there, and how it's in the 'top ten downloads' on the Wii U eShop or whatever, I expected to see it in the charts. To be honest my heart skipped a beat, as it usually does, when you post an article with MHX in. 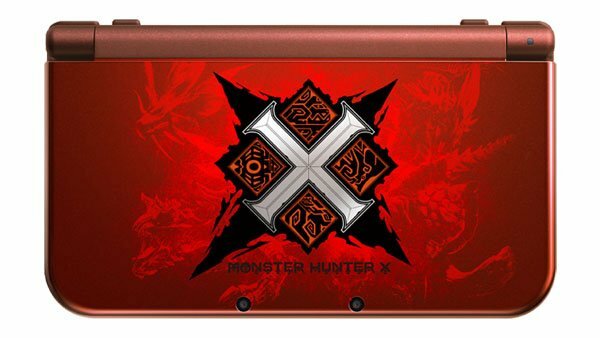 The 3DS needs Monster Hunter. It's such a good game that I'd even buy a Vita if it were to become exclusive to it. @ikki5 after the 1st 4 weeks last year in Japan, Wii U had only sold about 55K total so I'm guessing Nintendo is happy with the number this week. Probably falls down to 20K or less next week and back to the around 10K a week amount after that though. You know what's actually scary in this week's charts? Regular 3DS beats the regular new 3DS. That is pretty as hell! You mean Splatoon may actually outsell MK8 over there!? Inconceivable! Splatoon will outsell MK8 in a matter of weeks!! Awesome! Fates isn't in there?!?!? Isn't it the top 10 charts?!?! @ikki5 it will jump back up in 70 days. Pokken is already showing up on the coming preorder charts. The only wiiu title to ever do that with two months to spare is smash brothers. PS4 sells better than the Wii U, pushing 3 huge games that all came out after Maroo Maker. Yeah, it's not that surprising. I'm a bit more surprised that 3 games that was released at least 3 years ago made it in the top 20. Glad to know the old is not forgotten with the demand for the new. Rhythm Heaven is back up there. Still waiting for localization. Also the surge on old 3ds may have to do with MK7 and NSMB2 being in the top 20. Why is PS4 selling so well without any must have titles? How is it multiplats are pushing PS4 to new sales records? So assuming that Splatoon does overtake MK8 (yes, pun intended) in Japanese sales, how many people would have predicted that when Callie and Marie first started singing? I think Splatoon has already passed MK8 by in sales in Japan. @Xenocity Nope, the stats show Splatoon is behind MK8 by about 25k. Unless the NX is officially announced this week hence angering the Wii U community, Splatoon will overtake MK8 next week. @rferrari24 apparently according to famistu #FE sold around 50k which is now 6th Wii u title that didn't sell that well with Bayonetta, Captain Toad, W101, fatal frame, and Xenoblade on a console that has little install base. And a lot of games which it was realse during the holiday didnt sale that well either. But it expected. And for the ppl that hope it boomed only tells atlus that the no point of making another game on the Wii u or Nintendo home console for that matter. Good to know, thanks. I didn't think Bayonetta sales were just as bad, but what do I know. Wii U has always struggled. "2016 is now well underway, with all of the crushing realities of the post-festive period"
I just don't get all these depressing lead lines. Is this a British humour thing? Not surprising at all. PS4 has outsold Wii U in 2015 and in fact since PS4 launched in Japan. Poor Genei Ibun Roku #FE, it looks quite interesting, but to be honest, it always lack polish to me, the character movement and expression looks awkward. The animation part is awesome though, and so with the song. Sales is decent for Nintendo this week. Last two weeks is a surprise for Wii U, but holiday is over and now business returned as usual. @Xenocity I dunno. I guess that's why people keep saying the Wii U needs 3rd party support. I hope that FExSMT still comes out in the West, if it doesn't I will be so sad. Damn Nintendo why won't you released the normal size New 3DS over here. Now I had to suffer through this big plock of extra large New 3DS XL which doesn't fit well in my pocket.